"PDAs" redirects here. It is not to be confused with PDAS. The first PDA, the Organiser, was released in 1984 by Psion, followed by Psion's Series 3, in 1991. The latter began to resemble the more familiar PDA style, including a full keyboard. 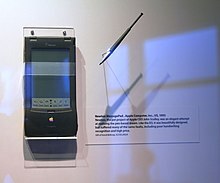 The term PDA was first used on January 7, 1992 by Apple Computer CEO John Sculley at the Consumer Electronics Show in Las Vegas, Nevada, referring to the Apple Newton. In 1994, IBM introduced the first PDA with full telephone functionality, the IBM Simon, which can also be considered the first smartphone. Then in 1996, Nokia introduced a PDA with telephone functionality, the 9000 Communicator, which became the world's best-selling PDA. Another early entrant in this market was Palm, with a line of PDA products which began in March 1996. Although many early PDAs did not have memory card slots, now most have either some form of Secure Digital (SD) slot, a CompactFlash slot or a combination of the two. Although designed for memory, Secure Digital Input/Output (SDIO) and CompactFlash cards are available that provide accessories like Wi-Fi or digital cameras, if the device can support them. Some PDAs also have a USB port, mainly for USB flash drives. [dubious – discuss] Some PDAs use microSD cards, which are electronically compatible with SD cards, but have a much smaller physical size. While early PDAs connected to a user's personal computer via serial ports or another proprietary connection,[specify] many today connect via a USB cable. 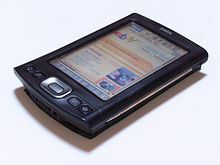 Older PDAs were unable to connect to each other via USB, as their implementations of USB didn't support acting as the "host". Some early PDAs were able to connect to the Internet indirectly by means of an external modem connected via the PDA's serial port or "sync" connector, or directly by using an expansion card that provided an Ethernet port. Many companies have developed PDA products aimed at the medical professions, such as PDAs loaded with drug databases, treatment information, and medical information. Services such as AvantGo translate medical journals into PDA-readable formats. WardWatch organizes medical records, providing reminders of information such as the treatment regimens of patients to doctors making ward rounds. Pendragon and Syware provide tools for conducting research with, allowing the user to enter data into a centralized database using their PDA. Microsoft Visual Studio and Sun Java also provide programming tools for developing survey instruments on the handheld. These development tools allow for integration with SQL databases that are stored on the handheld and can be synchronized with a desktop- or server-based database. PDAs have been used by doctors to aid diagnosis and drug selection and some studies[who?] have concluded that when patients can use PDAs to record their symptoms, they communicate more effectively with hospital staff during follow-up visits. The development of Sensor Web technology may lead to wearable bodily sensors to monitor ongoing conditions, like diabetes or epilepsy, which would alert patients and doctors when treatment is required using wireless communication and PDAs. PDAs and handheld devices are allowed in many classrooms for digital note-taking. Students can spell-check, modify, and amend their class notes on a PDA. Some educators[who?] distribute course material through the Internet or infrared file-sharing functions of the PDA. Textbook publishers have begun to release e-books, which can be uploaded directly to a PDA, reducing the number of textbooks students must carry. Brighton and SUSSEX Medical School in the UK was the first medical school to provide wide scale use of PDAs to its undergraduate students. The learning opportunities provided by having PDAs complete with a suite of key medical texts was studied with results showing that learning occurred in context with timely access to key facts and through consolidation of knowledge via repetition. The PDA was an important addition to the learning ecology rather than a replacement. Software companies have developed PDA programs to meet the instructional needs of educational institutions, such as dictionaries, thesauri, word processing software, encyclopedias, webinar and digital lesson planners. ^ Viken, Alexander (April 10, 2009). "The History of Personal Digital Assistants 1980 – 2000". Agile Mobility. Archived from the original on 30 October 2013. Retrieved 22 September 2017. ^ "History of the HP 95LX computer". HP Virtual Museum. Hewlett-Packard. Retrieved February 18, 2011. ^ Andrew Smith, Faithe Wempen (2011). CompTIA Strata Study Guide. John Wiley & Sons. p. 140. ISBN 978-0-470-97742-2. Retrieved July 5, 2012. ^ "3-Lib History of Psion". Retrieved 9 June 2015. ^ Kahney, Leander (August 29, 2002). "Apple's Newton Just Won't Drop". Wired. Condé Nast Publications. Archived from the original on September 2, 2010. Retrieved August 21, 2010. ^ Patrick (December 14, 2006). "Palm PDA Cables". DeepWave. Patrick Khoo. Archived from the original on August 30, 2010. Retrieved August 21, 2010. ^ "MC55A0 Rugged Wi-Fi Enterprise Mobile Computer". Retrieved January 26, 2013. ^ For example: "HP LaserJet 5P and 5MP Printers — Product Specifications". HP Business Support Center. Hewlett-Packard. Retrieved August 21, 2010. ^ "CommonTime - Cross platform mobile app development tools". CommonTime. Retrieved 9 June 2015. ^ "Sync calendar, contacts, tasks and notes to Android, iPhone, iPad, BlackBerry - CompanionLink". Retrieved 9 June 2015. ^ "BlackBerry — Enterprise Server — BlackBerry BES Server". Research In Motion. Archived from the original on July 13, 2012. Retrieved August 21, 2010. ^ "BlackBerry — Business Software Features". Research In Motion. Retrieved August 21, 2010. ^ "Ernest Khoo: Alternative operating systems on your PDA". Archived from the original on 2012-08-10. ^ "Highlights: Knowing the differences in PDA operating systems". Retrieved 9 June 2015. ^ "Palm Support: Palm GPS Navigator 3207NA". Retrieved August 21, 2010. ^ "10 tips to save on college textbooks". Centre Daily Times. August 20, 2010. Archived from the original on August 23, 2010. Retrieved August 21, 2010. ^ Davies, Bethany S.; Rafique, Jethin; Vincent, Tim R.; Fairclough, Jil; Packer, Mark H.; Vincent, Richard; Haq, Inam (1 January 2012). "Mobile Medical Education (MoMEd) - how mobile information resources contribute to learning for undergraduate clinical students - a mixed methods study". BMC Medical Education. 12: 1. doi:10.1186/1472-6920-12-1. PMC 3317860. PMID 22240206. ^ "ROLAND PMA-5 PERSONAL MUSIC ASSISTANT". Retrieved 9 June 2015. ^ "Pidion". Retrieved 9 June 2015. ^ CATCHWELL. "CATCHWELL - Handheld Mobile Computers". Retrieved 9 June 2015. ^ Two Technologies, Inc. "Rugged Handheld Computers and Android Devices - Two Technologies". Retrieved 9 June 2015. ^ "unitech - Global Website. Worldwide leading ADC manufacturer". This page was last edited on 13 April 2019, at 09:30 (UTC).